Dean Spears is a statistical economist who was recently awarded a Ph.D. from Princeton University. He has studied the impact of the Total Sanitation Campaign on child health in India, and has also concluded that the Nirmal Gram Puraskar is an effective way to motivate communities towards being free of open defecation. You can view this research paper here. In another paper, Spears argues that an important reason for children not growing in height to their full potential in India is bad sanitation. He has spent significant time in India over the last few years conducting this research. You can view this research paper, “How much international variation in child height can sanitation explain?” here. Earlier this year, he wrote about this in The Hindu, explaining how there is now statistical data that shows that the height of Indian children is correlated to theirs and their neighbourhood’s access to toilets. The ramifications of this research are significant in the sanitation context, and certainly do away with the oft-quoted reason for Indians and Asians being generally shorter compared to the west, that’s it’s genetics. Get a detailed analysis of Dean’s research findings on India Water Portal here. We were interested to know the process to apply for a Nirmal Bharat Abhiyan subsidy ,to build a household toilet. How do people apply for the subsidy? Who can apply for it? Do potential beneficiaries know who to go to? Do they know the process for building a toilet with NBA subsidy? 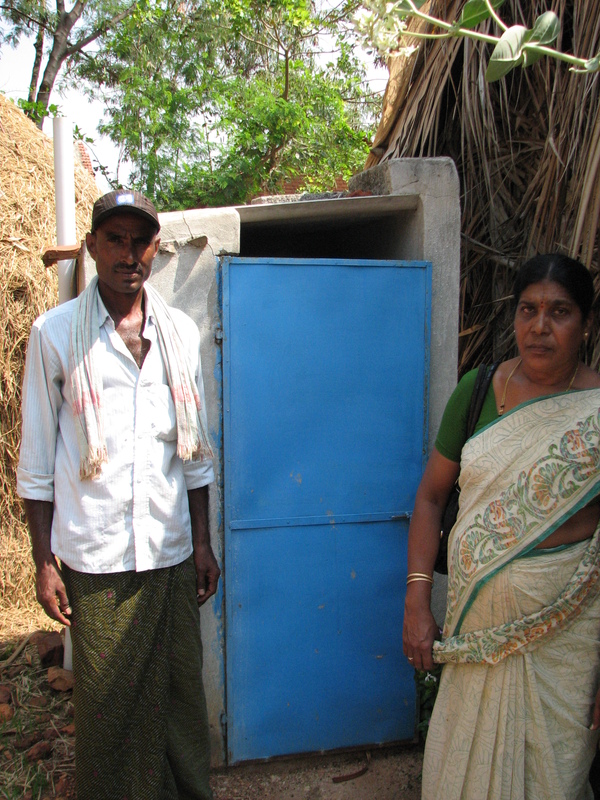 Here is a step by step account of how a rural household owner can apply for an NBA subsidy to build a toilet in his or her home, based on the research conducted in Davangere, Karnataka. Step 1: Who is eligible for NBA subsidy? The subsidy is provided to Below Poverty Line (BPL) and restricted Above Poverty Line (APL) families. If a person doesn’t hold a BPL card or is unsure about his eligibility, he must apply and the call will be taken at the Gram Sabha. The Gram Sabha happens once in 3 months. The person must fill out an application form. However, this can be done at a later stage as well, along with photographs documenting construction of the toilet. The photographs are mandatory to show proof of construction, in order to apply for the NBA subsidy. 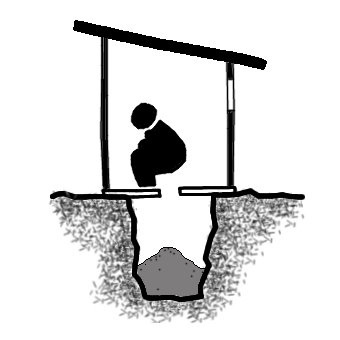 The beneficiary begins the construction of the toilet in his or her home, and must take photographs at 3 stages: after the pit is complete, at an intermediate stage and then the final phase when the super structure is complete. The person in charge of MGNREGA at the village level, called the MATE is a work site supervisor who knows where toilet construction is happening. During the construction, 15 days of work is to be put in by the family members and 5 days of work by a skilled worker. During the construction, the MATE comes to check if the work is being put in by the family. He or she will then submit this to the section officer. The beneficiary submits the application form along with photographs and asks the Gram Panchayat to come and take a look at his or her toilet. 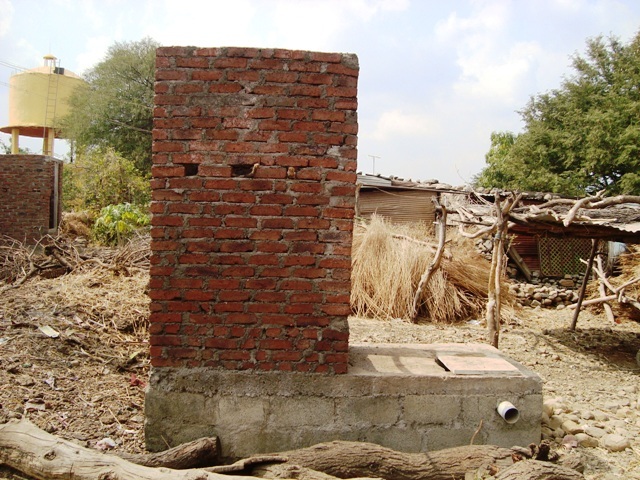 The Gram Panchayat will come in and inspect the construction and usage of the toilet. The section officer will come to check if the toilet is worth Rs. 9700, which is the total subsidy amount for an Individual Household Latrine under the NBA. The pit, foundation, walls and toilet bowl are a must. Tiles and ceiling are flexible. If satisfied, the GP can release the money, provided they have the funds. If the GP account doesn’t have the money, an appeal can be made to the taluk and funds can be shifted from one GP to another within a taluk. Normally, the GP issues a cheque, but sometimes they facilitate an online transfer of the subsidy too, when they have the facilities at the GP headquarters. Online transfers make the subsidy disbursal process more transparent. If funds are available at the GP, it should take about 3-4 days for the subsidy to be released. If there is a shortage of funds at the Zilla (district) level, it could take months. The section officer, based on the report from the NREGA official and his own visit to inspect the toilet, then submits something called a nominal muster roll online. This should take about 3-4 days. Once that is done, the GP can directly transfer the money to the account of the beneficiary. These funds are normally available.